Designer Barry Dixon’s quote about hallways explains it well. The concept of keeping things neutral in a hallway doesn’t mean bland or lacking in personality. Hallways say a great deal about the taste and creativity at work in a house. Few are so grand they need to make a statement — usually that’s reserved for the living room. However, an entry, landing, stairwell or other hall tend to be highly original when family photos or special collections are displayed. 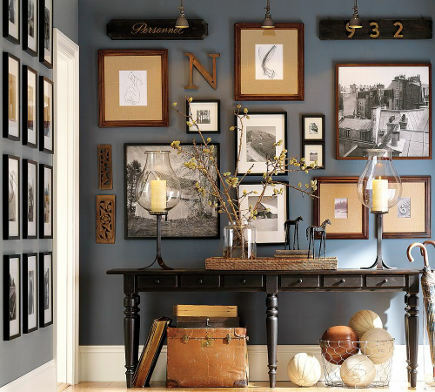 Personalizing hallway picture walls can be done by using a strong color behind any arrangement of pictures. That’s perfectly pitched in the gray hallway [top] where photos and objects are dramatized by the rich color. Pottery Barn’s Tivoli black painted console table creates a horizon line for the photo arrangement while the frame sizes vary. Objects are included in the mix along with letter art and both wood-tone and ebonized (black) frames. Because the table is antiqued black two black-painted wood pieces top off the grouping which also has a trio of light fixtures to add illumination and emphasis. A quieter adjacent wall is a simpler grid of black frames — all the same size — that begins above the doorway and ends a few inches above the baseboard in a more static arrangement. A young family’s DIY picture wall is an amalgam of meaningful photos, all framed in white, with objects mixed in. 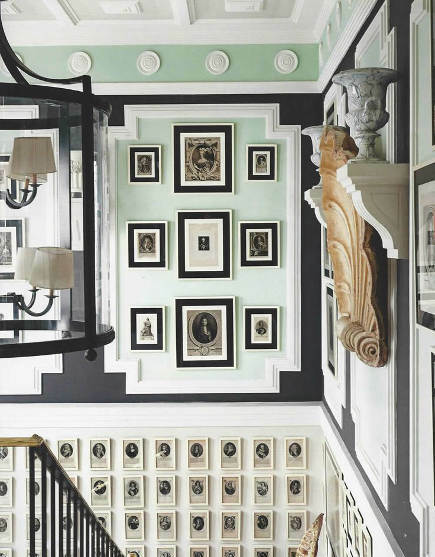 While the pictures float above a console table in the hallway, they continue down the wall to gracefully fill the otherwise empty space between the table and the door. While this wall also provides a gray background, the silvery hue offers much less contrast with the white frames. The result is softer, less dramatic and more neutral. Light green and aqua are mood colors that suggest a beachy aesthetic, especially on a planked wall. This vignette could well be one of those hallway picture walls in a beach house or garden room. 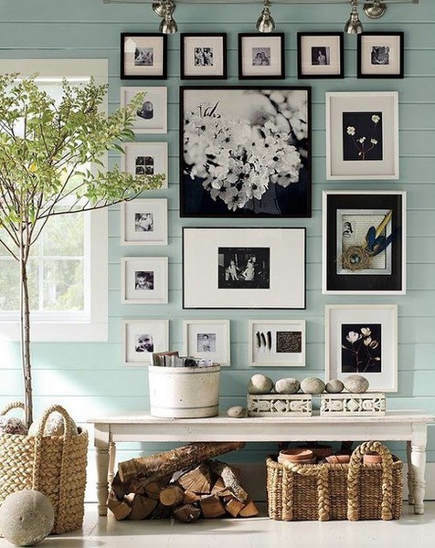 Mixed black and white frames are used above another Pottery barn table. The gallery grouping mimics the shape of the window and, being larger, creates balance on the wall very skillfully. I especially like the C-shape line of small square frames with black along the top and white along the window. 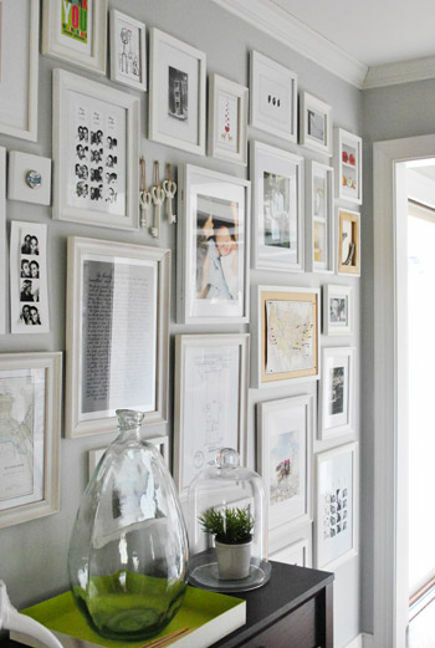 Larger frames fill in the center and add variety that makes the arrangement more interesting that it would be if all the frames were the same size. Spanish designer Lorenzo Castillo created an amazing effect with paint and pictures in an unusual hallway. Not everyone would know what to do with classical moldings and plaster niches or think of elaborate picture walls to decorate them. Then there’s that minty green color. I’m fascinated by the collection of framed miniature prints hung in ten rows across — in just this partial glimpse of the stairwell, 50 can be seen! With white frames, those blend into the pale wall and almost give the illusion of wallpaper. Above, larger prints take on a slightly optical effect. Each has a white border set off by black picture matting and white frames. The relative size and placement of the 9 images sits perfectly inside the cartouche. The whole idea might well have been inspired by the coffered plaster relief ceiling since no smart decorator ever fights the architecture. For me, this is a brilliant arrangement that could not have been as artfully accomplished on a less than high end budget. 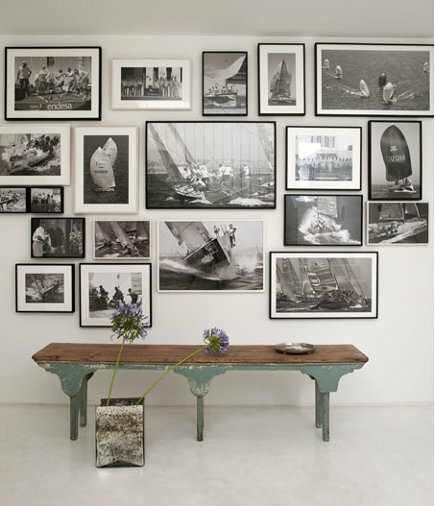 Black and white sporting photos create an informal picture wall above a vintage hallway bench. 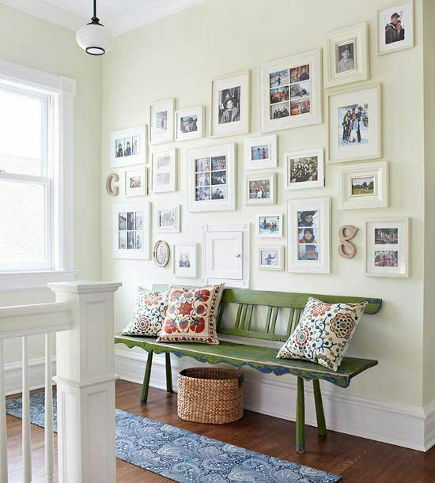 Like the arrangement on the pale green wall adjacent to the window (above) the larger photos anchor the center with smaller frames balancing them on either side. 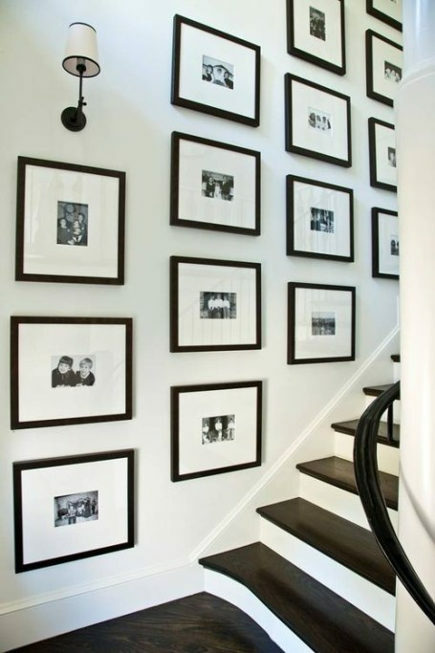 Personal family pictures occupy the main wall of an upstairs landing. A green cottage bench takes up the lower setion of the wall just under what appears to be an old-house laundry chute or a dumbwaiter door smack in the middle of the wall. White frames and abundant photos and objects help to disguise it well enough that one has to look very carefully to see it at all. 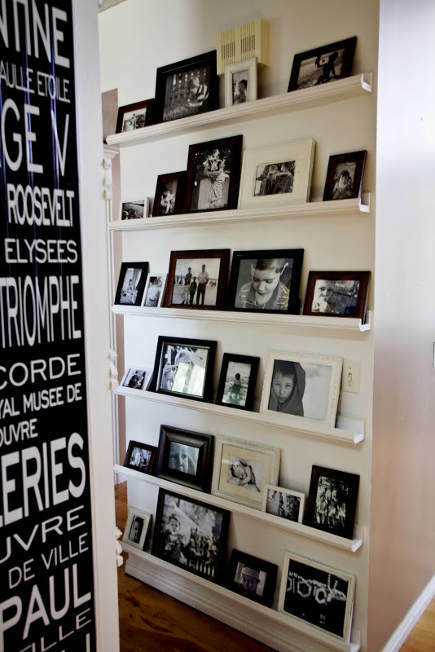 This DIY picture wall is based entirely on painted tray shelves which someone with a power saw can make. The how-to comes from Ana White who calls these $10 Ledges. This arrangement is budget-wise and flexible since photos can be moved around easily and only the shelves are attached to the wall. It’s also very visually effective due to the consistency of the black and white theme — all the photos are black and white, and so are the Dollar-Store frames. Speaking of black and white, it’s difficult to imagine a more dramatically choreographed stairwell. Black treads, white risers and a white wall with black and white photos, white matting and black frames. Even the sconce matches — a Phoebe Howard specialty. These are some great hallways, I’m especially loving the one with the mint green backdrop. It’s amazing! Really nice selection. I’m gradually building a display up my stairway with mostly gilded frames, but these are just terrific. Great ideas!! I love gallery walls and I have many pictures and frames but not enough confidence to put that many holes in the wall. Thank you for posting!! Jennifer, I make paper templates and paste them up first if the arrangement is complicated. Instant confidence!! Just a thought for you. Thanks for stopping by.